Tomorrow the sun will rise on the first official production day for "Die Walküre". So here I am, the Roger Corman of the opera world, embattled but not embittered, still waiting for Godot, though God will do very nicely. We've got an interesting new production manager coming on board. I haven't had the greatest luck with production managers — they seem to turn out to have been coke addicts, Trojan horses, or schizophrenics — but with each one comes hope. Hans Nieuwenhuis once told me that it took him eleven years to find the right one, and then, miraculously, many of the traumas of running his operation evaporated into thin air. Perhaps this will happen this time! I'm sure Richard Wagner would be proud of me, even though I am a member of an inferior race! I've also found out that the indefatigable Sophie Tanapura is putting on "Figaro" in July. This is splendid! 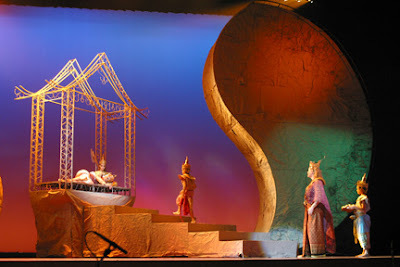 One of the joys of having turned Bangkok into the "operatic hub of Southeast Asia" is seeing other people put on their own productions. It's never easy to put on an opera. More things can go wrong in an opera than in any other type of performance. That's what keeps us on the edge of our seats. Everyone needs to buy tickets and show their support. I really look forward to the day when people in Bangkok will no longer say, "There's an opera next month" but rather, "Which opera shall we see tonight?" or, "Which did you like more, Somtow's Wozzeck or Trisdee's?" This, ultimately, is the vision that I had when I sold my house in L.A. and allowed myself to be worked like a dog with no pay. This is the reason I shrug off all the idiots dragging me through the mud, sending lying faxes and emails about me to each other, and so on. There's a higher purpose to all this and even my gratuitous torments have, in the end, helped to bring about the fulfillment of my vision. And speaking of Trisdee, I told you that yesterday night he sent me a pop song he wrote in Garageband! Splendid lyrics, the use of the "f" word guaranteed to raise a few eyebrows ... the most surprising thing of all is that kid's got a great pop singing voice. If he tires of conducting Charpentier, he'll have to work for MTV.